Getting to Guadalajara was very pleasant. When we checked in at the airport and got our boarding pass, it showed that we had been assigned to seats 1E and 1F and were part of boarding group 1. This was curious since I had reserved seats 32E and 32F which was confirmed when I did the online check in the day before. 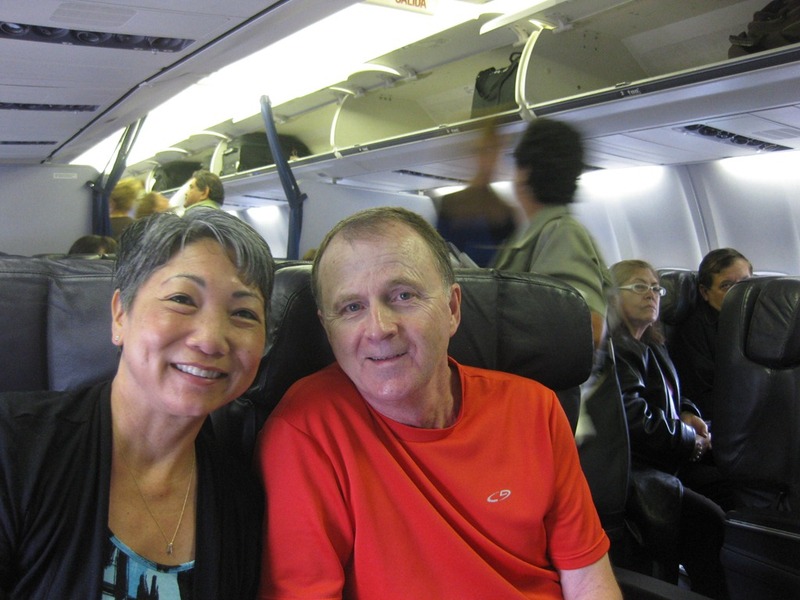 Once we boarded we found that our seats were in fact in the first row of the first class section. Apparently, we were moved up front without any fanfare. Not sure why, nobody ever mentioned it. Perhaps they had overbooked coach and had to move some of us to the front. At any rate we had a very comfortable 3 hour trip with roomy seats (in the photo below, Valerie had to lean across the wide armrest separating us) and a very nice hot breakfast. Once we arrived into the Guadalajara airport (Valerie had her rice confiscated by the customs inspector) and withdrew some pesos from the ATM, we took a 20 minute taxi ride into the center of the city near the Centro Historico and got settled into Hotel Posada San Pablo. 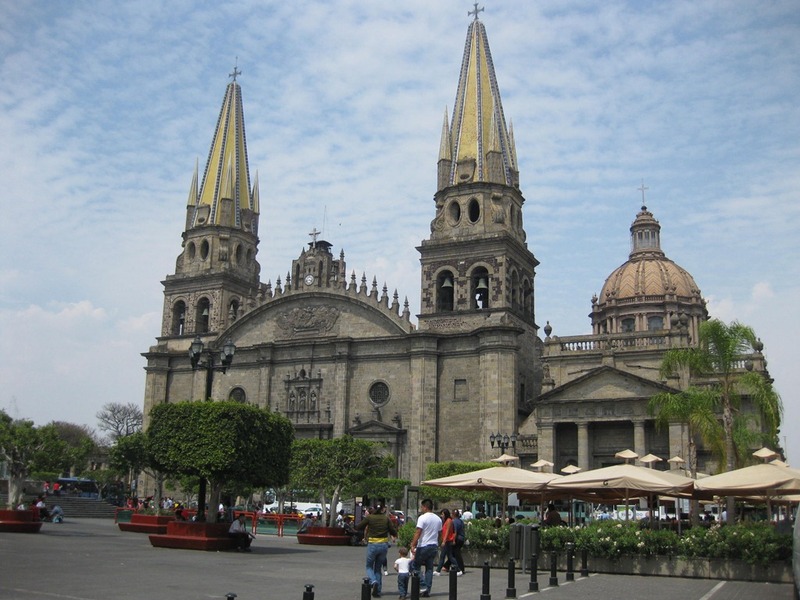 Guadalajara is on the same time zone as Central Time in the US, so 2 hours ahead of California. We had plenty of time to take an initial walk around the historical area and get oriented to key points of interest. On Friday, perhaps we’ll take advantage of the city tour bus that makes stops in several areas of the city. Yeh, that rice has been involved in several hi-jackings!!!!!!!!!!!! Indeed. Well, this was Mexican customs once we arrived in Guadalajara. Perhaps they thought we were going to start growing a strange new rice. Rice in the eyes is deadly. Yes, and Valerie wanted you to know that it was organic brown rice. Particularly tricky. Let us know if you guys are going to hit the travel trail. Boy, that must be some rice!! Thrown around to kill protected birds or what??? You know you can’t throw rice at weddings anymore because of the danger to birds. Maybe?? You two have the most unbelievable luck–that’s not the first time you have been upgraded without trying, huh?! Going to a children’s art show at the local Fine Arts Center–the boys will both have paintings displayed. Amy and the boys are coming from M’boro and Marquita is going also–then we will go out to dinner. Paul is playing golf today–with all the baseball games lately for both little guys, he needed a day off with the big guys. Be safe and have fun!! Hi there, what luck on the flight, that never happens to us! We just watched the Preakness and “I’ll Have Another” – the Derby winner won so it was very exciting, Hoping for a triple crown! It has been a very long time. It is beautiful here but very hot- already- glad you all are having fun. Hi, we watch the Derby, very exciting race.